On December 4, 2015, Richard was exiting a mechanic shop when he was struck by a forklift! He had a brief loss of consciousness and when he woke up, everything in his pockets were scattered all over the place. According to the police report, blame was actually put on Richard for walking in front of the forklift (see original diagram below). Richard felt pain in his neck, back, shoulder and left side of his body (left knee, leg, arm, hand, hip, elbow, and foot). He was transported by ambulance to the emergency room at Bellevue Hospital Center where he was evaluated, treated, and released home with a cane. Richard suffered a cervical/lumbar sprain (requiring pain management injections), a left shoulder sprain, a left foot sprain, and a left hip sprain. Due to the severity of his back injury, he underwent lumbar spine surgery. 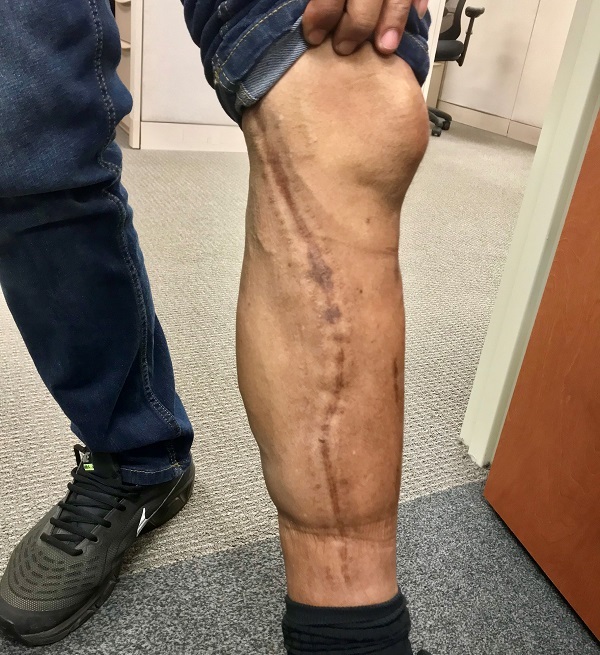 As a result of the surgery, Richard suffered complications that caused him to develop a blood clot (deep vein thrombosis also known as DVT) that required the hospital to cut open his leg to relieve the pressure (see photo below). Before the accident, Richard was employed as a full-time employee with duties involving lifting, carrying, sitting, standing and walking. After the accident, Richard had difficulty walking, bending, sleeping and lifting. As a result, Richard was incapacitated from employment. He attended physical therapy, chiropractic care, heat and acupuncture three times per week. Richard also uses a back brace, a cane, and prescribed medication to help alleviate his injuries. Richard initially hired another lawyer from a previous case. That lawyer did not check in with Richard at all and he felt neglected as a client. Then, once he got into the forklift accident, the other lawyer started giving him attention because it was a serious case. Unfortunately, even when he met with that lawyer to discuss the forklift case, that lawyer could not find his file since it was buried under other client files! Not acceptable. Around that time, Richard heard Adam’s show on Irie Jam Radio. Richard was so impressed by Adam when they first spoke, that he decided to fire the previous lawyer. While the police report put Richard at fault for the accident, The Case Handler team successfully proved he was the victim! As for the result, the maximum policy limit was $2,000,000.00 and with the help of Adam and The Case Handler team, Richard recovered an astounding $1,800,000.00 settlement award! Richard went through a life changing accident and we are incredibly grateful that he is alive and getting better every day. While there’s no amount of money in the world that would make up for the permanent injuries he experienced, all his medical expenses (past and future) associated with the accident are handled and the defendant was held accountable for his negligence. Congratulations to Richard for his settlement award and thank you for choosing The Case Handler team to represent you! 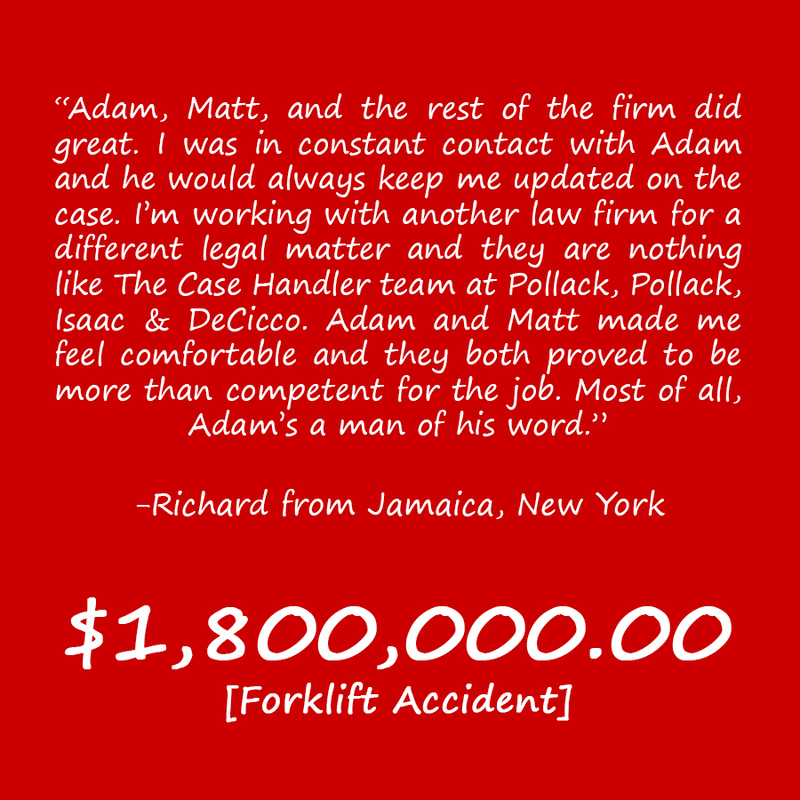 If you or a loved one have been a victim of a forklift accident, make sure to contact our experienced Brooklyn forklift accident lawyers at Pollack, Pollack, Isaac & DeCicco, LLP since other lawyers are “nothing like The Case Handler team” at PPID.